On Rick's tour itinerary, this morning is reserved for a boat ride along the coast. Mother Nature doesn't always comply, however, and the day was too windy so Mert regrouped. While we 'missed the boat' (I know, bad pun), I can only believe that we were equally as lucky having the opportunity to visit Perge. Perge was a Greek settlement before Roman times, and I was thrilled to learn that Alexander the Great had visited and spent time here on his travels. Alexander is a fascinating historical character to me and I've read several books about his life. I wandered the ancient streets lined with broken columns thinking that I may have been walking in his footsteps. 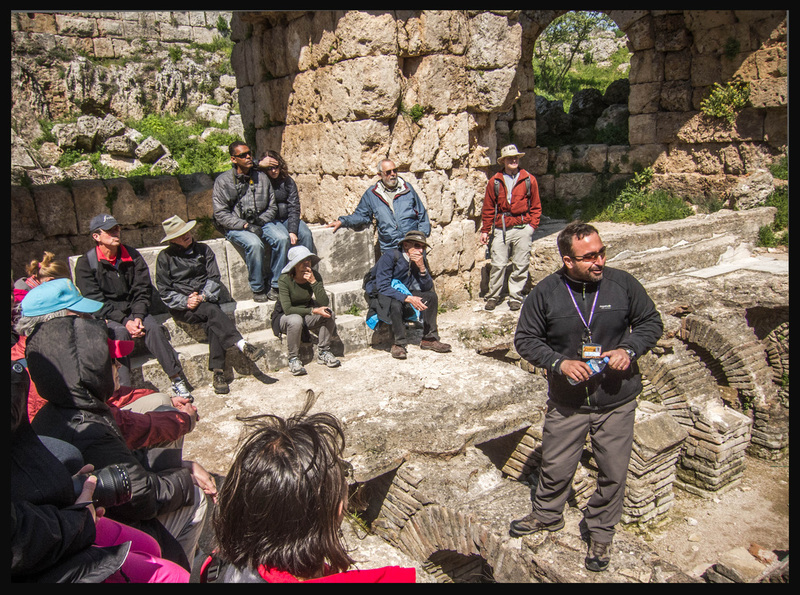 Our first stop in Perge was a visit to the ruins of the public baths and Mert spent some time explaining the ingenious Roman design, with hot and cold pools. Apparently eating and drinking was also allowed and it wasn't unusual for the combination of drinking alcohol and heating the body to cause heart attacks. Men and women bathed separately. Men had use of the baths the majority of time but there were special hours where only women were allowed. We learned that Perge was first a Greek settlement, then used by the Romans. Today, most of what we see comes from the Roman period. 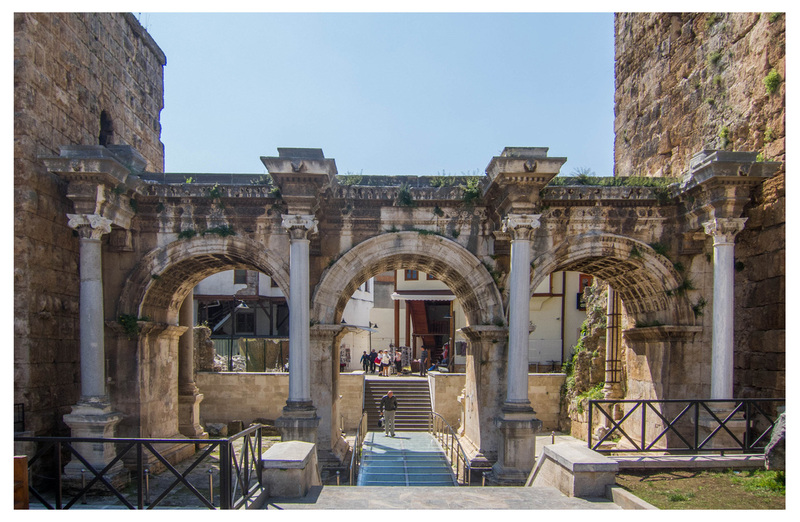 Our entrance into Antalya's Old Town was through this impressive stone gate built by the Emperor Hadrian. After returning from Perge to Antalya, we took a bus for several miles to reach the museum which is outside the city walls. Are these two having a conversaton? Antalya's museum is one of the largest in Turkey. Its exhibit rooms each cover a separate time in the country's history. We concentrated on the Hall of Imperial Statues. What made this of special interest is that these statues were excavated in Perge, where we'd visited that morning. I was surprised to find that sarcophagi were often mass-produced and the faces 'personalized' as needed. I added that information to the list of things I've learned on the trip. This statue is referred to as 'Tired Hercules"
We learned that the Boston Museum had the top half of this Hercules for several decades until it was noticed that it matched the bottom of this statue excavated in Perge. I decided to accompany this scary person to the Turkish baths! By this time, Fred's beard had grown and he looked intense wearing the hat we'd purchased as a gift for our son. At Turkish baths, women and men have totally separate areas in which to bath and also separate entrances. Fred and some of the other men in the group (this was an optional trip)decided to try this 'Turkish Bath' thing and six of the ladies (including me) also decided to go. We nervously huddled together, naked under our skimpy towels, until a women bather crooked her finger at each of us. Then it was off to lay on a big marble slab, get doused with soap bubbles, and scrubbed voraciously. Funny enough, after the nervous anticipation was over, we began to really enjoy ourselves, even adding the optional green clay facial to our experience. I wish we had something simple like this in California. It's not exactly a spa treatment but very satisfying.